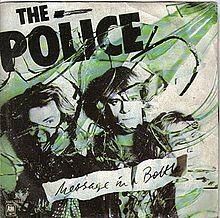 On 5 January 1980, “Message in a Bottle” by The Police was at #100, its highest position in the 80s. Its peak position in 1979 was #74. I knew in advance that the start of this project would be rough. New wave really hadn’t started catching on in the US, or even in Britain, by the beginning of 1980, and I’ve been bracing myself for all sorts of horribleness at the beginning of this project. So it is heartwarming to see that I get to start with The Police, a popular band I’ve always liked. “Message in a Bottle” is serendipitously appropriate, too, because, in a way, it captures internet culture in a way contemporary songs really haven’t. Ostensibly about a man stranded on a desert island, Message in a Bottle is really a lament about the desperation a person can feel in a crowded, but lonely, world. The music plays on this nicely: quick, feverish guitar as Sting sings about how he’s agitated and lonely, a flurry of mental activity as he writes his note, and then the music becomes lilting and wistful and he casts the bottle to the waves and starts to hope that there’s someone on the other end to rescue him from his solitude. And the music picks up at the joy of discovering one morning a hundred billion bottles on the beach, each a response to his original message! All those people out there that are just as lonely as the singer, or at least interested in that lonely person stranded out on an island! The song ends on a striving note, encouraging people to send out those SOS messages because somewhere out there, there’s a lot of people who want to read them. Is it any wonder, then, that Generation X took so avidly to the internet? As products of what seemed to be an increasingly atomized culture, children of Generation X found in the internet — with email, Twitter, Facebook, and blogs like this one — a more efficient way to make sure that like-minded people picked up their various messages in a bottle. Whatever the interest, there is someone out there on the internet, among the billions of people in the world, who shares it. Now we don’t have to be as angst-ridden as The Police were in trying to find those people.